Are you horse-crazy AND love crafts? Are you artsy? Creative? 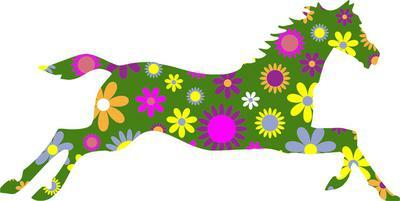 Well then, here are some creative horse art and crafts for you!! Do you like to paint? Draw? If so, why not try drawing or painting horses? They are a bit hard to draw at first,but keep practicing! Also,if you don't want to draw REALISTIC horses, why not draw CARTOON horses? Or maybe even abstract horses? Give 'em all a try! Are you crafty? Are you horse-crazy? If so,try some of these! Make a horse sculpture out of Play Doh or clay! Maybe make a horse CHARM out of clay! Make a horse charm bracelet! Take some horsey charms( a horse, horseshoe, carrot...) and attach them to a bracelet! Make horseshoe decorations for your room! Take a horseshoe and paint it any color(s) you want! Then hand it up in your room. Easy! Do you like to write stories? Are you horse-crazy? If so, here is some advice and help! You don't have to really publish your stories. You can submit them to HorseCrazyGirls.com. (here!) Everyone here would LOVE to read your stories! Non-fiction stories. Do you have a horse? You can write all about your horse and good times you've had! Fiction stories. Make up your own horse stories! Tip! It helps to get ideas on what to write when you read other horse stories! Comments for Get Creative! Horse-Crazy Crafts! I have to try that! Sounds awesome! I was looking through my old horse memory box. As soon as I opened it, I was overwhelmed with memories. Pictures of Quincy and Tango, a horsehair bracelet from Quincy's mane, poems about them and even a small bag filled with there favorite treats. I sat on the floor crying as I looked at these things of these beloved horses which are now in heaven. I honestly never made one for Peppy so immediately I asked my mom if she had any boxes around and I got to work on Peppy's memory box. I honestly LOVE it. Do you want a memory box of your beloved horse? Read on! 1) First find a box. You can use a decorative box, a cardboard box, a plastic container, anything. Mine is a cute box with a little quote that says "Cherish Each Moment". 2) If you have a cardboard or plastic box decorate! Write horsey or pretty quotes, draw things, it's all your choice. If you have a decorative box like mine then skip this step. 3) Gather all your memories. Photos, poems about them, horsehair bracelets. Anything you want is fine! If you don't have anything then snap some pics next time you go to the barn, write up some poems and have fun. 4) Fill your box with your memories. 5) You're all done! Remember to look through this box every little while to remember all your fun times! In my box, I have bunches of pics and selfies of Peppy and I, peppermints (his favorite treat), poems about him and my deeply cherished horse bracelet from his tail. Draw horses on iron-on and iron them onto your T's and sweaters, etc. Remember, iron-on reverses the image once ironed on, so best not write unless you can write mirror image, which is really tricky. Oops! I ran out of ideas. I'll try to give you more in the future. Here are some fun, easy, horsey things to do while you're bored on winter break! First take your mug and your pen or marker and draw a horse on your mug. Next, take the paint of your choice and paint your horse. It can be any color you like. Let the horse dry while you work on the next step. Take your sharpie markers, any color you want, and start by writing out horse related words in any angle you want such as different gaits, breeds, colors, the name of your horse or favorite horses at your barn, etc. Once all your words are written and your horse is dry, make up some delicious hot chocolate, apple cider or tea! Glue your picture of the horse onto your ornament then glue the name of the horse onto it above the picture. First, take your stocking and fill 1/4 of your stocking with the peppermints (if the horse doesn't like these you can substitute it with some horse cookies). Next, place some carrots and an apple inside along with any other items such as tack or grooming tools. Bring to the barn to your horse or lesson horse. Another fun thing to do would be to give stockings to rescue horses or therapeutic horses. First, write down a bunch of questions and answers about horses, hard and easy, in a notebook. Give 20 to 30 index cards to each person playing along with a pen or a pencil. Start by having someone without index cards read off a question. You and everyone else playing, write down your answer on the card and place it in the basket/box. The person who reads the questions will read the index cards and the person who answered it correctly gets a point. If you do have model horses, maybe try making tack for them! So far, I have made halters and lead ropes for my model horses, but you can make bridles, saddles, blankets, and other things for them too! You need a halter and lead rope! You don't want them to run off! There are so many videos and tutorials on how to make tack for your horses! Try it!